Have you grown tired of the color of your wood fence? Sounds like it’s time to paint! But before you do, read our blog on how to paint a wood fence to make sure you do it the right way. You’ll be glad you did! The first step in painting a wood fence is preparing. This involves preparing the area around the fence and preparing the fence itself. First, you should cut the grass by the fence and trim back any vegetation that is next to the fence so you have room to work. Blow away leaves and grass clippings with a leaf blower. Place a plastic sheet under the portion of the fence you’ll be painting (and move it as you progress in painting) to catch any paint that falls on the ground. Now it’s time to prepare the fence. The best kind of wood fence to paint is one that’s bare. You’ll want to sand off paint that was already on the fence, exposing the bare wood. This is because the paint will stick better to bare wood than other paint. Once you’ve sanded the fence, wipe off any wood dust with a rag. The final step is to put protective tape over things like gate latches and handles that you don’t want to get paint on. 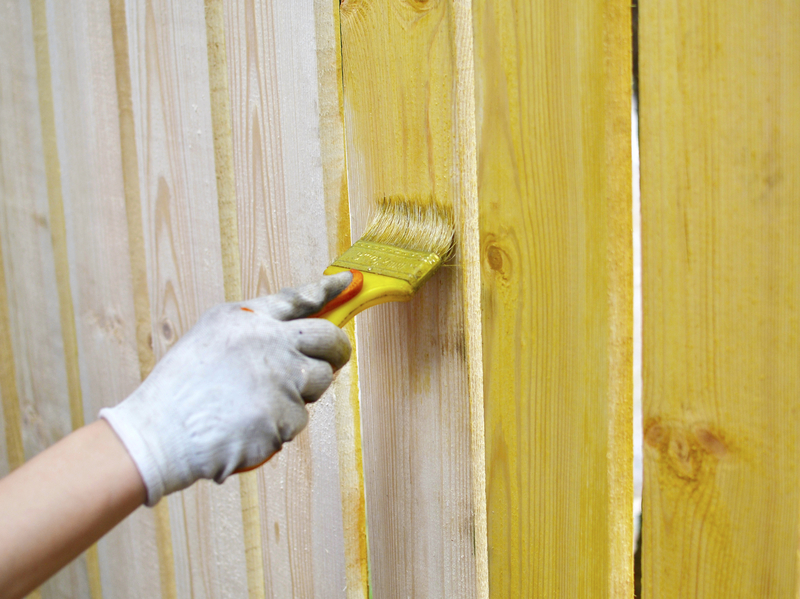 There are a lot of different kinds of paints you can use to paint a wood fence. For a wood fence, the most common choices are either oil-based outdoor paint, an acrylic paint/stain, or acrylic latex paint. Outdoor Oil-Based Paint – These have a nice looking finish, but will require multiple coats. They also don’t protect the wood as well as acrylic paint. Acrylic Paint – This kind of paint offers great protection. It will require a coat of primer. Acrylic Stain – A stain is designed to accent the aesthetic of the wood. You won’t need a primer for a stain. Acrylic Latex Paint – This combination acrylic latex paint offers great protection from moisture and sunlight. It can even expand and contract with heat to prevent cracking. Paint on a day with no rain or wind in the forecast. Rain of course will ruin the paint job, and wind kicks up debris that you don’t want on the fence you just cleaned and prepared. If you’re doing a big job, you might want to rent an industrial spray painter for efficiency. Aim the spray with the grain of the wood, and make sure to wear a respirator. Cover plants and bushes with a tarp to keep the paint off. For smaller projects, a brush and roller should do the trick. Start from the top and work your way down. This entry was posted on Thursday, November 6th, 2014 at 9:54 pm. Both comments and pings are currently closed.